Encompassing a diameter of 6mm and featuring a 7×19 construction of stainless steel wires, this modest-sounding rope still provides over two tonnes of load capacity and complies with AISI standards to ensure complete safety and resilience. Order any length of 6mm 7×19 Stainless Steel Wire Rope you need from us and choose fittings to include as well. Our stainless steel rope is sold in a selection of diameters and strand configurations. 1×19 rope is especially strong and rigid. 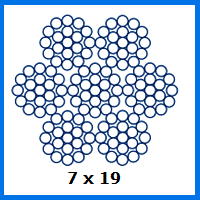 7×7 rope is moderately more flexible while still being suited to load-bearing uses. With 7×19 rope, the flexibility is dialled up even further, allowing it to be an effective component of rope slings, control cables and other assemblies. Corrosion will not have its way with this rope, while the sleek surface is simple to maintain and will stay looking the part for longer. As a result it is idea for use outdoors, as well as in places where it will be on show for all to see. Combine your 7×19 stainless steel rope order with extras that are installed for you by Rope Services Direct. We can provide turnbuckles and rigging screws, swageless terminals and many other types of wire rope accessory. Have a friendly chat with a sales representative by calling 01384 78004. Email the team with any question you might have or request a quote before making an order and we will show you why our customers always come back for more. 6mm 7x19 Stainless Steel Wire Rope Overall rating: 5 out of 5 based on 6 reviews.